I left the PA company to return to Hull to prepare to sit ‘A’ levels externally. It was just before setting off for the north in a hired van containing practically everything I owned that I called unannounced at a recording studio that was advertising in Studio Sound for a maintenance engineer. I think it might be better not to give the names of the companies or studios involved in this account, but the place was then owned by Virgin and those in the know about London studios should have little difficulty identifying it. I was interviewed there and then and even though I explained that I wouldn’t be able to take up the post until after my exams, I got the job. The studio had not been operating very long at that time (I learned that the Sweet had patiently endured all its teething troubles) and the studio had also been suffering a high staff turnover. I got the job because I understood a range of technical specifications, had been the only applicant able to tell a blown transistor from a working one, and because Barbara Craggs (and it turned out, my boss too) fancied me. I won’t elaborate on the latter, since this is intended to be an amusing memoir and not a treatise on sexual (or other) politics, except to say that women who complain about sexual harassment at work should count themselves lucky that they’re not male and their boss is queer. Besides Barbara Craggs, another of Virgin’s inner circle was Phil Newell. Craggs and Newell were rarely seen but when they appeared you certainly knew about it. Newell’s hobby was flying and we would occasionally find odd aviation instruments lying about in our workshop after one of his impromptu visits, usually, it seemed, when there was no-one else about. Newell was mentally unstable but was kept in place out of loyalty. One time one of the channels of the SSL desk in Studio 2 started behaving strangely, and the channel was pulled out and given to me to repair. Integrated circuits in the various “glue logic” families often share the same pin arrangements, so that they are interchangeable except, of course, they function differently. (Hence a quad NAND gate might share the same pin-out as a quad NOR gate.) Assuming I was looking for a fault and not sabotage, it took me two days with the channel on the test rig to discover that someone – who had a rudimentary knowledge of electronics, as Newell did – had swapped a logic chip of one type for another, sending the mode logic on the channel haywire. Newell was also an exponent of Ampex tape machines, and shortly after Studio 2 was fitted with a Telefunken 32 track (necessitating a special visit by a Telefunken engineer from Germany to bring the transport into trim), the discovery was made that someone had been in and cut a deep score across the face of one of its heads with a single-sided razor blade. The cost of the replacement was several thousand pounds. Plenty of well known artists came through these doors, so that it is difficult to know where to begin. Actually one is obvious – it was Mike Oldfield, whose success had practically been the foundation of Virgin’s existence. His visit to look around the studios had the flavour of a royal visit. I think I told him a little of the history of the desk in Studio 1, the largest desk Helios had ever made. They had gone bust making it. The Ruts made the album featuring ‘Babylon’s Burning’ in that studio and I might have had a cameo role on that, as there was a “crowd scene” with various people being pulled in to make up numbers. It was meant to portray some kind of after-hours argument, and while Mick Glossop (I think) was setting up for recording I came out with “You were looking at my bird,” a theme which was immediately taken up for its realism. It was either the Ruts album or the Jam ( Setting Sons ). One of the latter revealed to me that under their contract they were then being paid only £40/week, and had to make up their earnings with celebrity appearances and so forth. This illustrated the truism that musicians don’t make any money out of recording until after their third album. Rick the drummer and Weller were decent, but Foxton launched into a vicious diatribe against me one morning as I was lining up the multitrack and generally checking over the studio for their session. He was showing off, throwing his weight around in front of some groupie he’d picked up. I had plenty of hang-ups in those days, being brought up by a mad mother and transplanted from Hull to the ‘Big City,’ but I was never star-struck. I probably should have taken a swing at him, pop-star or no pop-star – some things are worth losing a job for. But then, I was applying the rule that if you don’t know what to do, it’s usually better to do nothing. I wasn’t sad when the Jam split. Notable for their visits to the studio (and, we understood, several others) were Public Image. The first time they came I had set up the studio as usual, lining up the multitrack mainly, and had some time to spare. So I was sitting at the console browsing through the tape handling parameters of the SSL autolocate routines, seeing if there was room for improvement. There was a monitor built into the wall above the glass, in between the monitors – various “secret codes” had been entered to get inside the system as I had. No doubt the software would seem pretty tame now with the advent and ubiquity of computers since, but then with the lights dimmed and the desk glowing it must have looked quite impressive. While I was scrolling through the codes someone came in and seated himself on the Chesterfield settee at the back of the control room, and I half-turned to ask “Are you something to do with Public Image?” It wasn’t until about 10 minutes later when I finished and got up to leave that I realised it was John Lydon. I’ve always had an appalling memory for faces but even I couldn’t fail to recognize this one. PiL quickly became notorious for arriving late at night and working through it, leaving all sorts of rubbish behind including syringes in the lavatories. 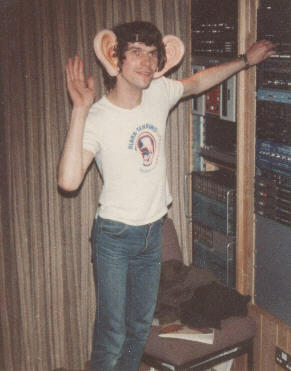 Their regular engineer was Nick, who we presumed was the only one who could put up with them for any length of time. He had formerly been on the studio payroll but had made the mistake of being enticed into Barbara Craggs’ bed. Nick was to play a decisive role in my life later. When PiL came to record they dragged piles of tape reels around with them (these usually being stored in the library below), with hours of material being produced, only a tiny fraction of which was fit for use. We heard how one night Jah Wobble had lain on his back in the studio, too inebriated to stand, wailing into the microphone. I raised some ire when, during a particularly indecorous session, one of the band had urinated in the back of the effects rack to the right of the desk. Normally the SSL desk welcome message read “Welcome to <insert studio name here>” but after the urinating in the control room incident, the next time they came in I changed it to “This is a recording studio not a stable, PIL.” The band made their displeasure known but I didn’t care. Robert Fripp came a couple of times, in two widely separated visits, and stunned the engineer by picking up the conversation on his second visit at precisely the point at which it had lapsed months before. He was a highly amusing and likeable character. Another session we had was Black Sabbath, and I remember a distinctly frolicsome atmosphere in the control room at the start. The sessions were intended to be for backing tracks, if not a whole album, but they lasted only a couple of hours before some playful member of the band put a lighter to the drummer’s trousers and set him on fire. He had to be rushed away for treatment, bringing their booking to a premature end.